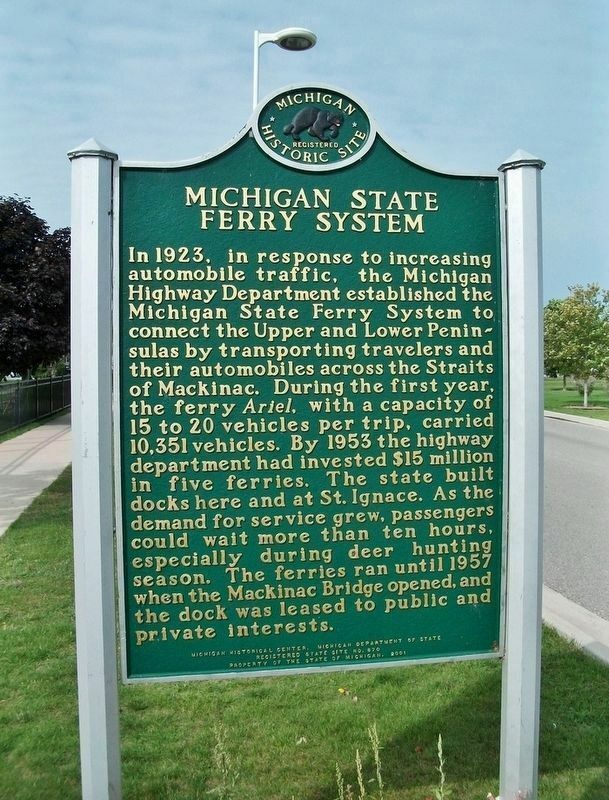 Michigan State Ferry System (side 1) In 1923, in response to increasing automobile traffic, the Michigan Highway Department established the Michigan State Ferry System to connect the Upper and Lower Peninsulas by transporting travelers and their automobiles across the Straits of Mackinac. During the first year, the ferry Ariel, with a capacity of 15 to 20 vehicles per trip, carried 10,351 vehicles. By 1953 the highway department had invested $15 million in five ferries. The state built docks here and at St. Ignace. As the demand for service grew, passengers could wait more than ten hours, especially during deer hunting season. The ferries ran until 1957 when the Mackinac Bridge opened, and the dock was leased to public and private interests. 1926 to carry passengers between Port Huron and Sarnia, Canada. The State Ferry System operated five vessels during the summer season and contracted with the Mackinac Transportation Company to carry automobiles on Chief Wawatam and Sainte Marie during the winter. The “Era of the State Ferries” officially ended on November 1, 1957, when the first vehicles crossed the Mackinac Bridge. Location. 45° 46.632′ N, 84° 43.535′ W. Marker is in Mackinaw City, Michigan, in Cheboygan County. Marker can be reached from South Huron Avenue north of Wendell Street, on the right when traveling north. Touch for map. Marker is located east of South Huron Avenue along the right (south) side of the driveway as you enter the Straits State Harbor parking area. Marker is at or near this postal address: 409 South Huron Avenue, Mackinaw City MI 49701, United States of America. Touch for directions. Other nearby markers. At least 8 other markers are within walking distance of this marker. Edgar Conkling 1812-1881 (about 500 feet away, measured in a direct line); Mackinaw City Railroad Dock / USCG Cutter Mackinaw WAGB 83 (approx. 0.2 miles away); Mackinaw's Civil War Cannons (approx. ¼ mile away); The Algomah (approx. ¼ mile away); Mackinaw, Mackinac or Michilimackinac? (approx. ¼ mile away); Mackinaw City (approx. 0.3 miles away); Iron Horse (approx. 0.3 miles away); Chief Wawatam (approx. 0.3 miles away). Touch for a list and map of all markers in Mackinaw City. More. 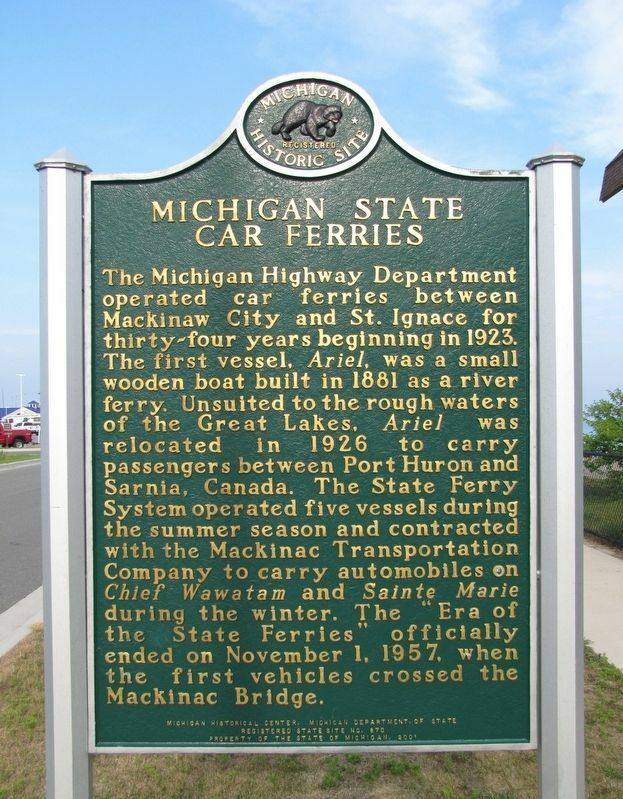 Search the internet for Michigan State Ferry System / Michigan State Car Ferries. Credits. This page was last revised on April 5, 2019. This page originally submitted on April 1, 2019, by Cosmos Mariner of Cape Canaveral, Florida. This page has been viewed 53 times since then. Photos: 1, 2. submitted on April 3, 2019, by Cosmos Mariner of Cape Canaveral, Florida.